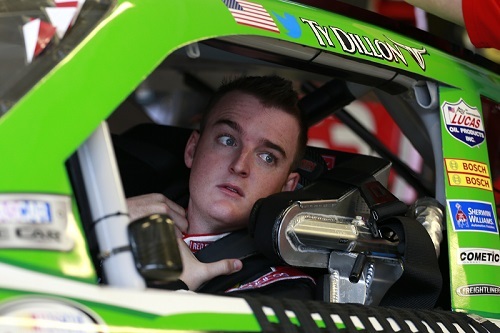 Ty Dillon will go full-time NASCAR premier series racing in 2017, as he’ll take over the driver’s seat in the No. 13 Germain Racing Chevrolet, replacing Casey Mears. Germain Racing announced Dillon’s hiring Monday. Crew chief Robert “Bootie” Barker will remain with the No. 13 team as crew chief, as will longtime primary sponsor, Geico. Germain Racing has a technical alliance with Richard Childress Racing, owned and operated by Dillon’s grandfather Richard Childress and the team for which Dillon has raced in the NASCAR Xfinity and Camping World Truck series. Dillon spent the last three seasons as a full-time driver in the Xfinity Series. He also ran two full seasons in the Truck Series. In all, the has 164-career starts across both those series, resulting in four wins — three in the Truck Series and one in the Xfinity Series. Dillon said Monday that he still plans to run a partial schedule in the Xfinity Series next season. Dillon already has 18-career starts at NASCAR’s top level, driving for Circle Sport and then Circle Sport-Leavine Family Racing and as a substitute driver for Tony Stewart at Stewart-Haas Racing. Eleven of those starts came in 2016.